Eat well at the parks: In 2012, Disney introduced the Mickey Check, a tool that makes it easier to identify nutritious choices in stores, online and while on vacation at Disney parks and resorts. Look for the Mickey Check on kids’ menus, which include meals such as a carved turkey sandwich with carrots and apple slices. Check the nutrition guidelines at disneymickeycheck.com. Visit the new Fantasyland: The recently expanded Fantasyland offers several attractions for the littlest ones, including It’s A Small World, The Many Adventures of Winnie the Pooh and Peter Pan’s Flight. But the coolest ride improvement for parents is Dumbo the Flying Elephant. Inside, there’s a circus-themed play area where kids have fun before the flight. Parents get pagers that will hold your place in line while they sit in the air-conditioned tent area. No standing in long lines with little kids! By the way, you can stay in the play area. Splash and play around Epcot: While the big kids design their own virtual concept vehicle at Test Track, take the younger ones to the Radiator Springs play area or one of the splash zones at Epcot. 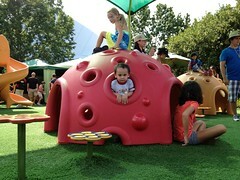 The Land of Oz Garden and the Backyard Play Garden are great places for toddlers to roam and get worn out. Stay up late: Let’s be real. No one stays on a strict sleep schedule at Disney World. Make the most of your time by allowing your kids a later afternoon nap and head to the parks in the evening after dinner. While folks are watching the fireworks, take advantage of the cooler temps and short lines at most rides.